Music will be provided by Spare Parts. Prompting by Barbara Menard Pugliese and Antonia Pugliese. We will be be putting together a room block at a local hotel. We will be posting more information as we add classes and activities to the event. Suggested costume: Evening dress from the years of Victoria and Albert’s marriage, 1840-1861, or modern evening dress. A black dress suit in 1840 to 1861 style is appropriate for men, though a dress military uniform or court dress would be super-extra spiffy. A ball gown from the years 1840 to 1861 is appropriate for women, and extra jewelry and tiaras would take your ensemble to the next level. 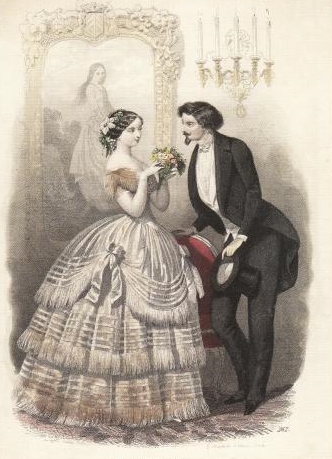 For those who don’t have period clothing, gentlemen should wear a dark suit and ladies should wear a formal dress with a long skirt. It would be best to avoid modern casual clothing—short skirts, shorts, jeans, t-shirts, short-sleeved shirts—and definitely avoid wearing sneakers. Our dances are reconstructed from period sources, and we strive for historical accuracy. 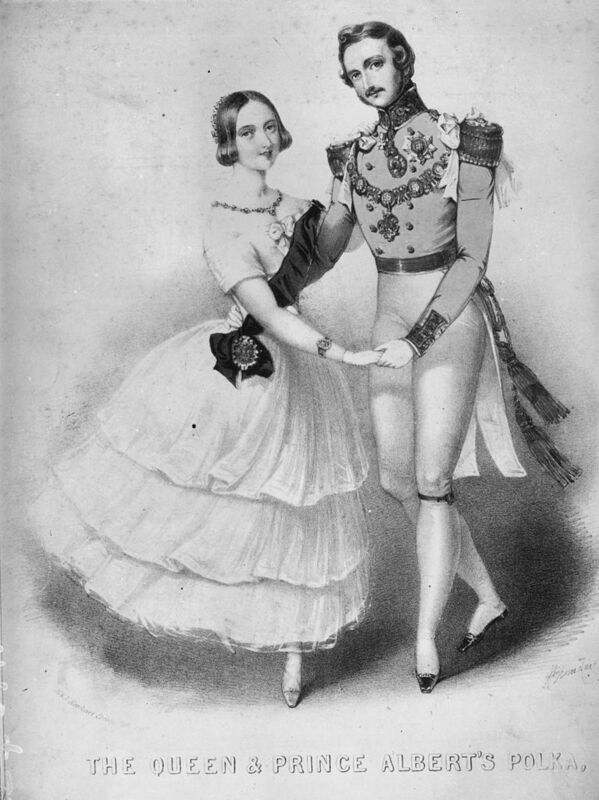 Our 1860s waltz is related to, but different from, a modern ballroom waltz. It can be done whirling around the grand ballroom, or can be danced in a more restrained manner in the center of the ballroom. Our 1860s contradances use simple walking steps in patterns. They are easy to join in, and quickly become a lot of fun. The Victoria and Albert Ball will have dance instruction as part of the evening. We will teach contradances and get everyone, both beginners and experienced dancers, involved. We will also play waltzes and polkas for those who have a little experience with whirling couple dances. If you are physically impaired, you might wonder if there will be dances you can do. We find that in every era there are some dances that are technically challenging and other dances that are pretty easy. There will be things for the hot-shot dancers and other things that are easy for all ages and types of people. The simplest dances require a brisk walk; that is, walking in time to the music. Sometimes they involve sliding to the side or walking in circles. If you come to an event, you will quickly see what you are able to do. No. The dancing we do is a fundamentally social activity. You are welcome to bring a partner, and many people enjoy our events most if they have a small group of friends to dance with, but there is no problem with attending solo and meeting new people. We cannot insist that people change partners—some people dance with only a single partner as a matter of comfort or because of medical concerns or injury. On the other hand, people learn best from dancing with lots of different dancers. When we teach classes we encourage partner changes, and we hope that mindset carries over to our balls. As a rule of thumb, do not be afraid to ask strangers to dance, but do not be offended if they decline. Do you use non-gendered dance terms? No; we use the terms “lady” and “gentleman” that were used in nineteenth-century dance manuals. We use these terms for the dance roles. A person in the lady’s role begins on the right side of a couple and generally steps off with the right foot. A person dancing the gentleman’s role begins on the left side of the couple and generally steps off with the left. You should pick a role and stick with it for the length of the dance. You can dance the same or a different role for other dances in the evening. You can wear clothing of whatever gender makes you feel comfortable and confident, but this doesn’t force you into one dance role or the other. Children who are able to display adult manners and follow directions are welcome to attend our balls as participants, but should be accompanied by an adult. 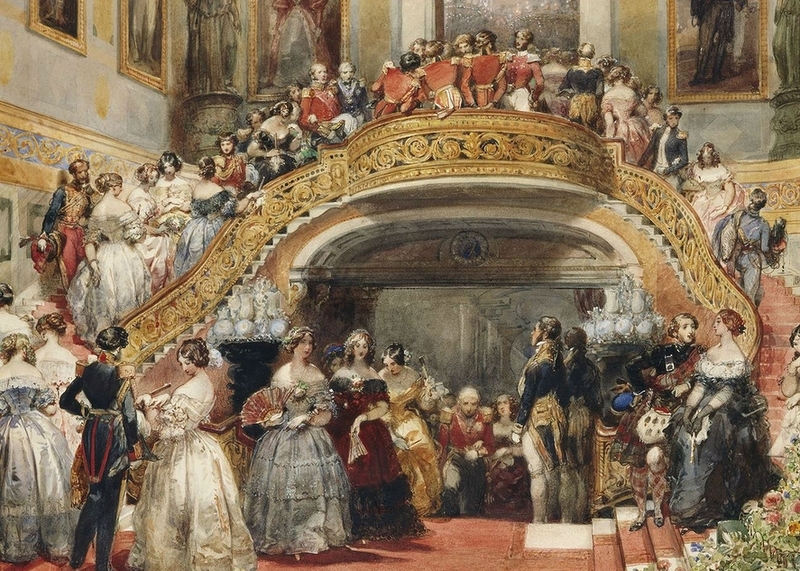 Children are charged the adult rate for the Victoria and Albert Ball. Children who are too young to participate in the event are discouraged from attending. For this ball, historical clothing is greatly admired but not required. If you wear modern evening dress, you’ll do fine. Please, do not wear sneakers, shorts, jeans, t-shirts, short-sleeved shirts, or overly short skirts to our formal events (casual clothes are fine for dance classes but not for balls, and sneakers are never safe to dance in). If you are interested in making a historical outfit and have some sewing skills, there are many commercially available patterns. Past Patterns is a favorite because each pattern is an education in historical sewing. There are other historical pattern companies that do great work. The big commercial companies have historical patterns, but they often use modern construction techniques and can look a little costume-y. Stick to nice cotton or silk fabrics, and you’ll come up with something beautiful. If you do not sew and would like to buy an outfit, there are usually many sellers on Etsy and eBay that make Civil War and other historical clothing. Some of these are much higher quality and more accurate than others, but there is so much turnover in sellers that it is hard for us to make recommendations. Look at lots of pictures and original garments to educate your eye before you jump into buying something. Tickets to the Victoria and Albert Ball are non-refundable.